Corsair has decided to add a new wireless headset and a gaming PC case to its already existing Vengeance brand, used for various PC components and peripherals. The new Vengeance 2000 wireless headset and the Vengeance C70 PC case will be available for purchase later this year. Turning to the specs the Vengeance 2000 wireless headset comes with brushed aluminium, 50 mm drivers and microfiber ear cups plus some blue and white colors that complement the headset nicely. 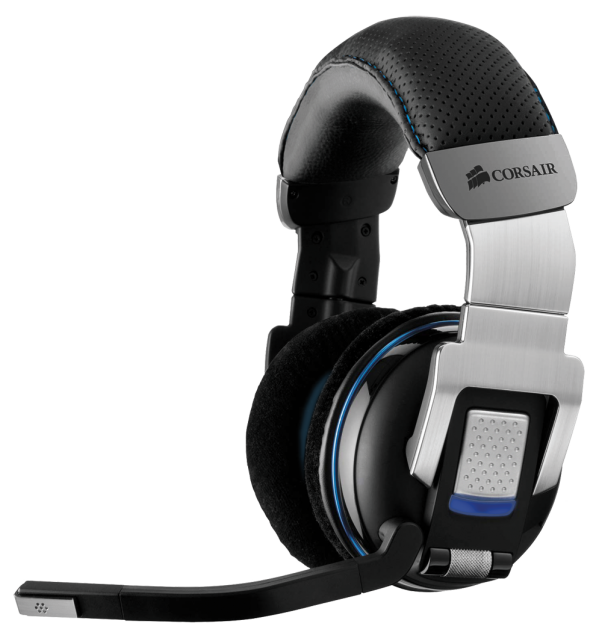 Instead of a cord Corsair utilizes 2.4 GHz wireless to deliver 5.1 and 7.1 virtual surround sound up to 40 feet away and with a battery life of 10 hours. The headset further features a noise canceling microphone and battery that can be recharged via micro USB cable. This micro USB cable does not make the headset wired – instead this USB cable is used for charging and firmware flashing only. The Corsair Vengeance C70 PC case comes with a rather unusual design that hints of impending heated gaming battles. The case features a steel front panel, eight PCI-E slots, and two removable hard drive cages with space for three 2.5-inch or 3.5-inch drives for a total of six hard drives. The PCI-E slots and other internals use standard Philips head screws. 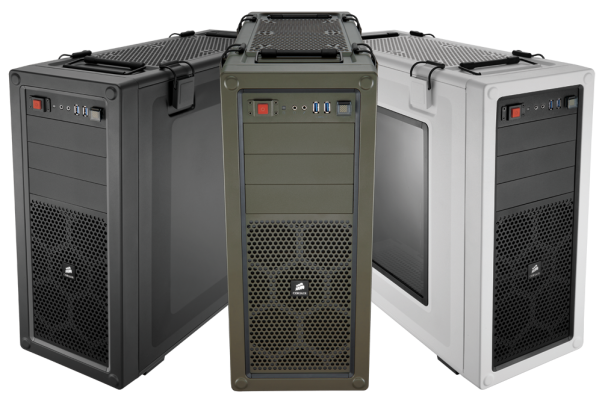 Available in three colors – Military Green, Arctic White and Gunmetal Black the C70 case features a honeycomb mesh up front for up to two fans, three 5.25-inch drive bays and two large buttons for power and reset with power being the large red button. 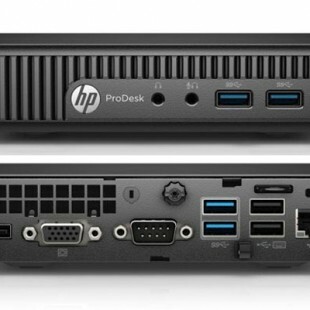 It also houses microphone and headphone jacks, and two USB 3.0 ports. All three C70 cases have two carrying handles on the top that fold down into recessed parts of the case when not being used. The new Vengeance C70 PC case will be available for purchase this May for 139 USD MSRP, while the Vengeance 2000 wireless headset will cost 149 USD and can be purchased starting in June 2012.